Continuing our conversations with a number of leading koi breeders to report their farming objectives, this time we visited the Marudo Yorijo facility, which is famous for raising jumbo koi. We interviewed the farm's third generation farmer, Toshihiro Hirasawa, with great anticipation and excitement because of this farm's outstanding success. The farm is located in Ojiya City near Yamakoshi, the cradle of Niigata Nishikigoi and covers approximately 5 hectares of land. The second generation farmer, Hisashi Hirasawa opened the farm after being trained by Dainichi Yorijo. He and his son, Toshihiro, work together and they recently celebrated their 35th anniversary. They raise Kohaku, Sanke and Showa along with the Asagi and Hikarimono varieties. Their specialty is the Showa Sanshoku. Hisashi Hirasawa acquired his koi breeding skills working under Dainichi Yorijo for as many as 18 years. During his training he gained insight in to the importance of koi confirmation and the quality of the Hi for which Marudo Yorijo was highly regarded. Their exports to foreign countries have recently grown at a rapid pace and presently as much as 90 percent of their production is exported, with the EU and China being primary destinations for their fish. Their annual koi production is also rapidly increasing as a result of their hard work. It's important to note that foreign farmers are also making strides to increase their output and quality. 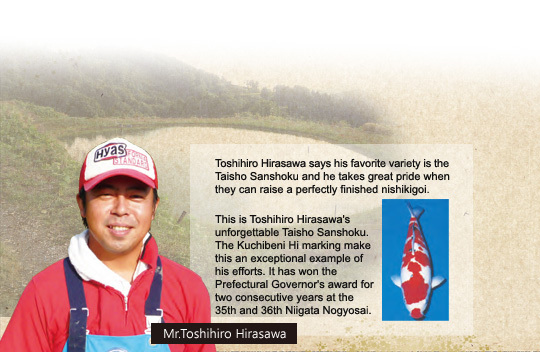 This makes international competitions more and more competitive and requires a keen focus to produce first-rate koi that clearly identify them as genuine Japanese Nishikigoi. Q.What is your breeding policy? When choosing parent koi, we don't adhere to any specific lineages. We are trying to cross the best of various bloodlines so that we can get offspring with exceptional potential. More importantly, we always search out female parent koi with a large build and lustrous skin, and a male partner with additional characteristics to compensate for any shortcomings of the female. Crossing of a splendid female and male doesn't always produce outstanding offspring. Our keen eye cultivated and developed through years of experience helps us identify candidates to meet our goals. Technically speaking, we've found frequent feeding with careful observation is also an important practice that brings us success. In Japan, August and September are very important months to make our koi grow rapidly, during this period we primarily feed them with Saki-Hikari® Growth Diet sinking type. We work diligently to develop koi with a stout build and qualified Hi markings, and are constantly working to improve our processes to develop that "ideal" specimen. We use large-scale, natural field ponds in the mountains of Ojiya with help from the farm members residing there. This combination of natural environment and superior care help us grow the first-class koi we are known for. Q.Which koi food do you feel is best suited for your farming activities? We look for foods that will help our koi gain flesh, brightness of color and luster. We believe there are several important factors that bring about half of our ultimate success; breeding skills, water quality control, parent koi selection and so on. The other half directly relates to the quality of the food we feed our parent koi and offspring. Fortunately for us, we have the option to choose from a large variety of koi to cross and foods to use to meet our objectives. Consequently, the capability of a koi farmer directly relates to his ability to practice and maintain his breeding skills and water quality. I always ask food manufacturers for food rich in variety to give us as many options as possible to bring about the result we desire. In the past, we had tried many different Koi foods, but unfortunately none of them helped us achieve a satisfactory result. As a result, we switched all of our feedings to Saki-Hikari® this year. I found it to be a reliable food because I saw the growth of our koi was more even and they gained flesh ideally. We also found the amount of their excrement decreased and it saved us a great deal of trouble cleaning. Until now, I have been looking for a more powerful color enhancing diet than ever before to create the ideal Marudo Kohaku. Fortunately, Hikari® released an extreme color enhancing diet "Saki-Hikari® Deep RedT" that is ideal to meet our demand and we are readily feeding it now. I am really excited about the future potential of our koi using it !